Microsoft released the fourth version of the cumulative update patch KB4469342 for the company's Windows 10 version 1809 operating system to the release preview ring. The latest version of the patch brings the build to 17763.168; if it holds up, Microsoft could push it to the Release channel next Tuesday on the monthly Patch Tuesday. Microsoft released a series of bad updates for its Windows operating system in recent months. The company released the October 2018 Feature update for Windows 10 in early October but had to pull the update shortly thereafter when reports about data loss issues emerged on the Internet. Microsoft acknowledged the bug and added a large number of bugs to the listing over the course of two months that included issues with mapped network drives, fonts, audio playback, and Windows Media Player. Microsoft employees Dona Sarkar and Brandon LeBlanc published a list of issues that KB4469342 will fixe on the Windows Experience Blog. It fixes the file association bug, the bug with zip archives, and plenty of others but not all that are mentioned under known issues. The list does not include the fixes or improvements in the new build that Microsoft released on December 1. Microsoft added another issue to the growing list of issues acknowledged officially by the company on December 1. 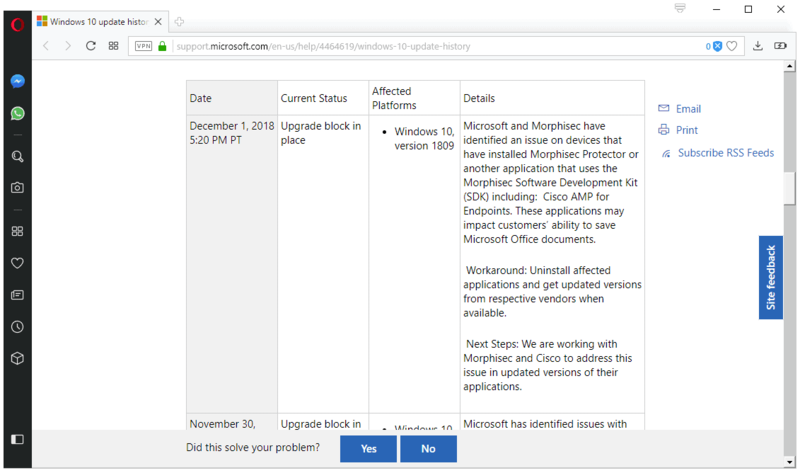 Systems that run applications that use the Morphisec Software Development Kit, Cisco AMP for Endpoints or Morphisec Protector, are blocked from receiving the Windows 10 version 1809 upgrade at this point in time until the issue is resolved. Has Microsoft learned from past mistakes? While it is certainly too early to answer the question with a firm "yes", it appears that Microsoft changed the update strategy in two key areas. The company publishes known issues on the official Windows 10 Update History website. One could argue that the sheer number of issues caused the change, but it is quite possible that Microsoft attempts to improve communication by making vital information available that it might not have made available previously. The second change is related to time; Microsoft takes its time to develop and test the next cumulative update for Windows 10. It is certainly true that the company is under a microscope and that failure to deliver a working bug-free update would drop user satisfaction and trust further, and that this may be the driving force behind the two-month delay. Microsoft needs to get this right and that certainly plays a major role in the development process for that particular update. There is hope, however, that Microsoft will use the same process for future updates and especially for the larger feature updates for Windows 10. I take well-tested updates that may take longer to develop -- as long as needed -- over faster updates any time of the day. Microsoft needs to get updates right, especially with the rapid release cycle of feature updates for Windows 10. Now You: What is your take on this? Progress or just damage control? The fourth preview of a patch? How does one top that? They can top it by issuing a fifth one! or an Nth patch until it’s renamed Windows 12. Is it still the October Update? 2018? 1809 will have larger version number than 1709 or 1803 when it gets released. For a new install, is 1809 the one to go for… presuming the issues documented with various applications isn’t an issue? This patch is meaningless to me. I’m still at build 17134.407 (v1803). BTW, did anyone else find that the update history was wiped by something MS did recently? This has happened on two PCs with Win 10 v1803. Every day in Windows 10 world is EXCITING! I can’t wait til next Tuesday to see if all my computers will start after updating. This is what I signed up for when I was forced to agree when “upgrading”. Feels like I upgraded from a cold to colon cancer.. I generally wait until the 44th release of the same patch before confidently applying it… oh wait. I just did an upgrade from 1803 to 1809 (8 year old laptop) and clean installed on a couple 7 inch tablets (16gb hard drives oii), now running 17763.134 without seeing any problems, yet. May be time to disable updates. KB4469342 went through a few hours ago and can happily say all went well. A manual Update check at 18:50 EST brought my Windows 10 x64 Home 1809 up to Microsoft Windows [Version 10.0.17763.168] as expected. No problems so far, other than my taskbar was reduced from 3 lines to two, and after restart completed, “stuff” was running at 25% CPU for 15-30 minutes.